October’s focus will be on the Second Commandment – “You shall not take the name of the LORD your God in vain.” Our virtuous action for October is: thoughtful in speaking about God. October is the month of the Rosary, the special sacramental we use to pray the “Hail, Mary.” Students will have multiple opportunities to pray the Rosary throughout the month of October. Teachers will be checking with students to be sure they have a rosary. If your child does have a rosary that can come to school, please be sure to send it with them. If your child does not have a rosary, we have rosaries here at school for them to use. Also during the month of October, we talk about Fire Safety and Respecting Life, from conception to a natural death. It will be a busy month. Students are working on Fire Prevention activities, including posters and essays for the annual Fire Prevention Contest run by the Delaware Volunteer Firefighter’s Association. Congratulations to our September Students of the Month! September’s virtue was faithfulness. 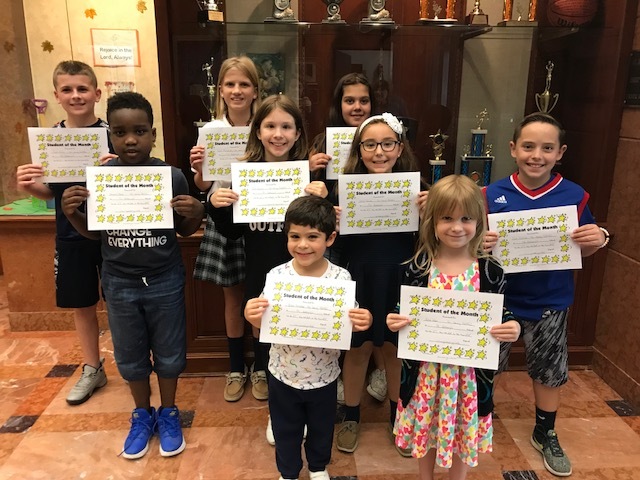 Congratulations to Stella Botsford (PK 3), Edward Harper (PK 4), Julian Detlefsen (K), Sylvie Keen (1st), Desmond Denny (2nd), Brenan Truver (3rd), Cecilia Ramos (4th), Ellie Koontz (5th), Zach Brelick (6th), Sarah Mazalewski (7th), and Blake Reilly (8th)! Way to go ! Thank you to our Home and School Board for a wonderful Crab Feast! The rain did not dampen our spirits. Everyone had a great time! Please be sure to check both the school calendar on our website and the school’s Facebook page for more information regarding Home and School events. Blessing of the Animals – On Tuesday, October 2nd, please join us for the Blessing of the Animals in the spirit of St. Francis of Assisi. The brief prayer service will take place in Father Tucker field at 2:00 P.M. All pets are welcome (as long as they are on a leash or in a cage). Students are welcome to bring photos or drawings of their pets if parents are unable to bring their pet to school. Picture Day Retakes – Picture retakes will be Thursday, October 4th. Please make sure your child or your child’s teacher knows that they will need a retake. We are walking in honor of our 8th Grade student, Mateo Ahumada, who is currently battling Leukemia. We are also walking to celebrate the lives of survivors and to honor the memories of those who have lost their lives to cancer/leukemia. This event is near to my heart because my son, Christopher, battled childhood cancer at this very hospital. They saved his life! And now, those very same doctors and nurses are helping Mateo, his former St. Anthony church buddy (when Christopher was a student here). Come out to walk with us. It is a short walk, approximately one mile. There is great food, music, prizes, and more! We hope to have a large group representing St. Anthony’s. Join our group, “Mateo’s Jedis,” or join individually. We would love to have you on our team! School is closed on Monday, October 8th for Columbus Day. Mr. Shields and I will attend the annual Columbus Day Mass and breakfast. The Columbus Day Committee has been so kind and generous to our school over the years. Every year, they make a large monetary donation toward our school. In the past, we have used this money to reach our technology goals for the building. Columbus Day Mass and Breakfast – The 22nd Annual Columbus Day Mass and Breakfast will be held on Monday, October 8th. Mass will be celebrated by Bishop Malooly at 7:30 A.M. at St. Anthony of Padua Church. The homilist will be Oblate Provincial Vy. Rev. Lewis Fiorelli, OSFS. Breakfast will immediately follow after Mass in Padua Academy’s Cafetorium. This year’s honoree is Ernest (Ernie) Camoirano . Proceeds benefit St. Anthony of Padua Parish and the Oblates of St. Francis de Sales Retirement Fund. Tickets are $35.00 or tables of up to 10 for $350.00. Other sponsorship opportunities are available. Purchase tickets or tables online at: https://squareup.com/store/sapgs or by contacting Michael Malchione at: 302.652.4194 x122 or via email: mmalchione@dossnet.com. On October 11th, our 8th Grade will celebrate the Feast of Our Lady of the Rosary at Holy Spirit Church. They will pray the Luminous Mysteries together with other students from the Diocese. This is a beautiful tradition. Dress Down Day on Halloween – The Catholic Diocese of Wilmington Marian Pilgrimage Board has asked us to hold a schoolwide Sesquicentennial Dress Down Day to support the Diocese celebration of 150 years! The cost for this dress down day will be $2, and all faculty, students, and staff are encouraged to participate. We will be holding this dress down day on Halloween. More details will follow on the dress requirements for the day. Please send in your donation of at least $2 in order to participate. If your child does not wish to participate, please still consider sending a donation. The CDOW Annual Marian Pilgrimage Board has commissioned an original painting from renowned local artist Neilson Carlin, whose The Holy Family was featured during the World Meeting of Families and Pope Francis’s visit to Philadelphia in 2016. This new painting is entitled Our Lady of Wilmington. It is a beautifully unique painting of Mary, the Cause of Our Joy! This painting will go on tour throughout the Diocese in each participating school. All are welcome to attend all or part of the pilgrimage day on October 6th at the Shrine of Our Lady Queen of Peace, on the campus of Holy Spirit Parish. The day concludes with 4:00 P.M. Mass that fulfills Sunday obligation, and presentation of Our Lady of Wilmington to Bishop Malooly and the Diocese. I will unfortunately not be able to attend due to the Light the Night walk against Leukemia and Cancer. For more information, contact Father Brian Lewis at fatherbrianlewis@gmail.com. Uniform Reminders – The fall/winter uniform starts on Monday. Shorts are no longer permitted. As the weather starts to get colder, please be sure to send your child in with a jacket or outerwear of some kind. Students will go outside for recess every day, except for inclement weather. Hooded sweatshirts are not allowed on a regular uniform day or a gym uniform day, even when they are for a St. Anthony’s sports team. This is a safety issue. October Parish Monthly Social – The first parish social of the fall will be held on Sunday, October 7th, in the Ballad Room of the Grade School, following the 9:00 A.M. and 11:00 A.M. Masses. Stop by for food, fun, and socializing with fellow parishioners and friends. The social, as always, will feature a variety of great donuts and tomato pie from Serpe’s Bakery, delicious breakfast pizzas from Degnars Greenhill Deli, and more! Hope you can join us! Please follow us on Facebook (St. Anthony of Padua Grade School Families, Alumni & Friends) to see updates, events, and photos from our days. Be sure to check out our website calendar at sapgs.org. It is updated regularly and is where we will be listing all of our events. Previous Previous post: September 14, 2018 Tiger Talk!